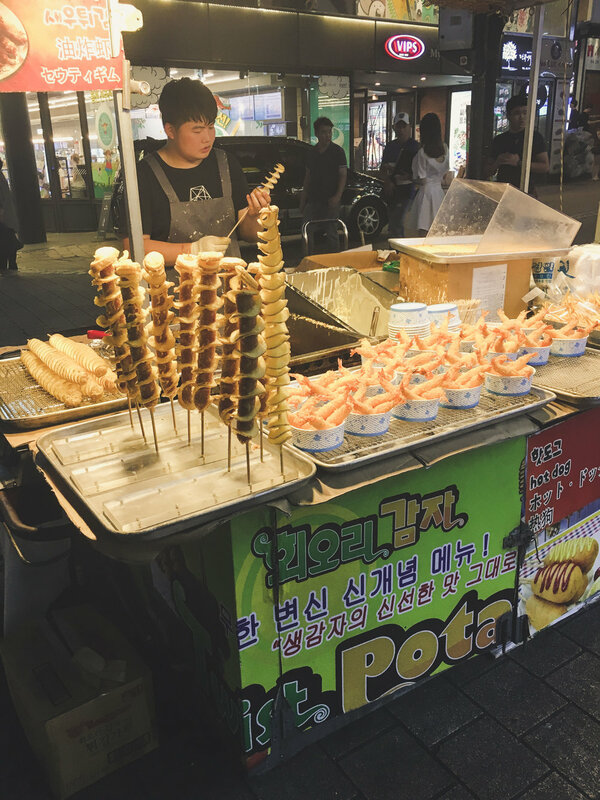 Welcome to part II of my Korean travel diary! We'll pick up a little farther along than we left off, on Thursday, July 13th. After our one night excursion into the South Korean countryside to Yongin, the next morning, we made our way back to Seoul. We stopped for a client site visit along the way, but made it back to Seoul in the early evening. It was our final evening with this client, so they wanted to treat us to one last dinner. Side note: as with most every culture (though not as emphasized in parts of the US), sharing meals is an integral part of the culture. It is a time to socialize and in doing so, brings you closer together and builds trust. Our last meal with our Korean hosts was in a very traditional Japanese restaurant. Our hosts knew the owner and called ahead for a reservation and to request something very special. The owner of the Japanese restaurant is a master in sashimi. More than just the slices of raw meat that we get from our local sushi restaurants here in the states...but a true artist in the preparation and consumption of raw fish. Rather than simply come to the table to serve or greet us, he prepared the sashimi on his knees, with a sue chef at our table. Skillful and mesmerizing he was with the large filets of fish and varying knives. We consumed many types of fish that he sliced for us, but the most memorable is this type of white tuna, that he torched with a butane torch at our table, then fed us from his hands. Yes, you read that correctly. He fed us with his hands one by one, as this was seen as a sign of respect and entertainment. In addition to the incredible at-table sashimi, we were also served a variety of very raw, and rare (at least to us Americans) seafood. The picture is of a platter of varying sea creatures, including sea squirt, sea urchin, and sea cucumber. After saying goodbye to our Korean hosts, we were dropped back off at your original hotel, the Shilla Stay. We checked in and stayed in the rest of the evening, and there was still one more client visit first thing the next morning. The next morning, we got up, had breakfast at the delicious hotel buffet and set about our morning headed to client visits. We weaved in and out of the bustling Seoul rush hour traffic as if we were in the back of a cab in Manhattan. Skip ahead several hours after our final client meeting, we headed back to our hotel to change and begin our solo exploration! We each had a couple of things on our list and we began immediately with the exploration of the mecca of all meccas for Korean beauty...Myeongdong. As of 2016, the South Korean beauty market was estimated at roughly $13B USD, ranking in the top 10 in the world; and Myeongdong is a district in Seoul (much like the furniture district, pet store district, garment district, etc) that is the epicenter of all things Korean beauty. Hundreds of stores (think TonyMoly, Skin Food, The Face Shop, ItSkin, The Saem, Etude House) occupied every nook and cranny for miles. The popularity and density of this market is so great, you'll often find repeats of the same stores less than a block from one another. As we wondered the streets of Myeongdong for hours, gawking (and buying, let's be honest) some goodies from the brightly lit and enticing Korean shops, street vendors came out in droves. We snacked on little shrimp kabobs and gamjajeon (traditional Korean potato pancake), but we really had our hearts set on Korean BBQ. Above one of the many shops in Myeongdong, we found a restaurant. The jet lag was starting to set in, and it had been a long day, but we enjoyed our traditional meal just the same. After dinner, the shops were beginning to close, and the streets beginning to clear. We headed back to the hotel to rest up for our only full day of exploring in Seoul! 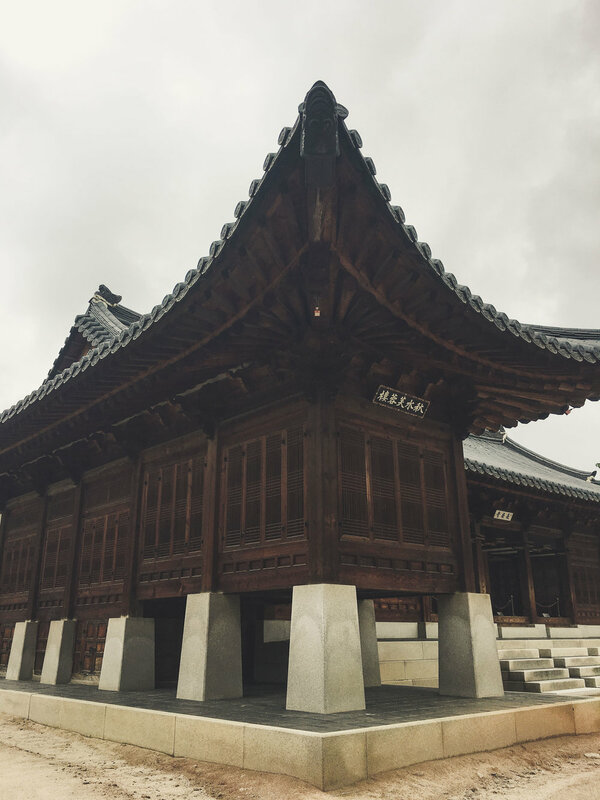 On our agenda the next day was four things: tour the Gyeongbokgung Palace, see Seoul from the top of the Seoul Tower, tour the DMZ, and wander through the varying food markets. After breakfast and snacks from this adorable bakery we wanted to make it to the DMZ. The Demilitarized Zone (DMZ) is the border between North and South Korea and is the most heavily guarded border in the world. Tours of the DMZ are offered and available to civilians, but unfortunately for us we did not plan ahead. PRO TIP: If you'd like to tour the DMZ, background checks and advanced reservations are required. Bring your passports with you as well. Seeing as we did not prepare in advance (and our Uber driver had a malfunction with his phone that cancelled out the whole trip and would not reinstall the trip), we did not make it to the DMZ. On to plan B! Instead of the most dangerous border in the world, we spent the morning at the Gyeongbukgong Palace. Sprawling, beautiful and right in the middle of the city. For only $8USD, you had unlimited access to the entire grounds of the palace, including the working libraries, modern museum and all residences. We walked in and between building after building (inside of which, photography was strongly discouraged). The architecture was traditional, beautiful and certainly worth the time and cost. Within walking distance, or a very quick drive to the city center, it is a must on the list of attractions to see in Seoul. Up next were the street markets! One of our coworkers (there were three of us) arrived in Seoul a day early and stumbled upon a street market that he wanted us to tour. We Uber'd to the beginning of where the food market district began, and started walking. As we made our way through the streets to the market, the sites we saw were one in a million. I couldn't stand back far enough to take a shot of the enormity of this overflowing cart on the street in Seoul. Vendors of all kinds packed their stands, storefronts and street carts beyond overflowing to accommodate excess product. Live eel, urchin and sea creatures for purchase swam in shallow pools on the ground with busy foot traffic. I stopped at a street vendor to purchase a hand fan (more on that in part one), and we continued exploring. Fresh Octopus and squid for purchase in the doorway of a fish market storefront. 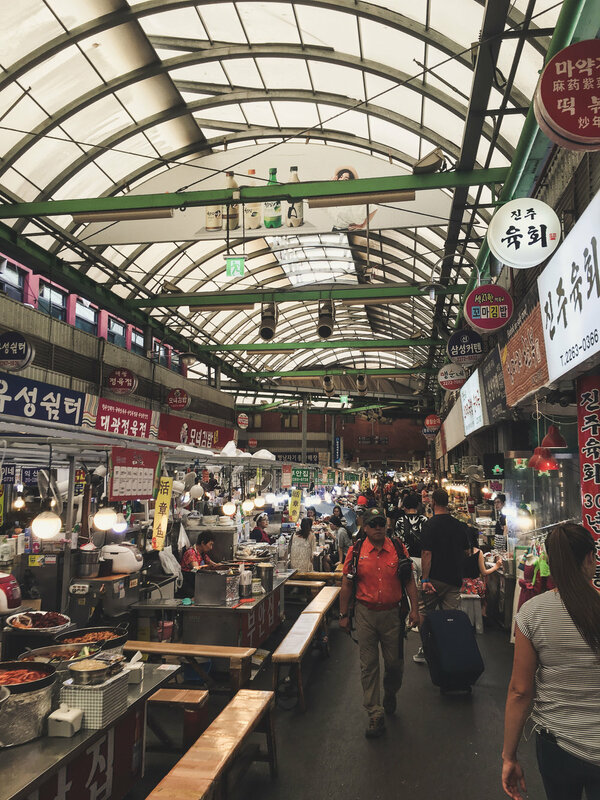 One of the largest and our favorite of all the markets we visited was the Shin-Jin market. Part retail shopping, and mostly food vendors, this semi-open air maze is filled to bursting with shops, food stands, and hungry Koreans. Each food stand in the middle was complete with a small bench and table top to seat a group of 3-4 to enjoy the food of purchase. Large pots boiled full of fresh seafood, grill-tops were searing potatoes, fish, vegetables and noodles. After gorging ourselves once again on the delicious freshness of Korean food while in the Shin-Jin market, our next stop was the Seoul equivalent of the Seattle Space Needles...Namsan Seoul Tower! The 774' tall tower is the second highest point in Seoul behind the Bukhansan Mountain. From the ground, you have two options to get to the observatory elevator...take the stairs, or ride the tram. We chose the suspension tram. I highly recommend, as the views of the city from the height of the moving gondola were breathtaking. From the exit of the tram, there is a broad walkway to the base of the tower that has shops, small restaurants, a ticket counter, a small stage and seating for performances and an expansive balcony area whose railing was PACKED with colorful padlocks of all sizes. We purchased our tickets to the observatory deck and climbed in the psychedelic, starry night themed elevator for the quick ride to the top. As you would expect from a tower so tall, even on a very hazy and drab day, the views were spectacular. To walk around the entire tower cook only a couple of minutes, but from every angle, the views of the city were incredible. We headed back down to the street via the tram to catch our Uber back to Myeongdong to grab something to eat (again, I know), when we were not so subtly reminded that though South Korea is a democratic nation, all those that border are not. Not pictured because we were quick walking away, is the street police officer that threw us the "big X" because we threw away trash in a compost bin (that we obviously could not read). With less than 24 hours left in Korea, and one of our collegues was leaving that night, we finished our day by heading back to Myeongdong for one last night of street food vendor gorging. We ate all we could before our trio became a pair, then headed out of the pouring rain across the street to the famous and massive Lotte Department store and mall. Inside, we found all high end brands imaginable, from Louis Vuitton to Celine to Gucci. I became obsessed with the new Gucci bags and stared at them in the window until my male co-worker physically left me! We wandered through the shops and department store oogling the Eastern world's fashion trends, spending habits and people watching. When we reached the end, we wanted to head back to the Myeongdong side of street as it is close to the hotel, and stumbled upon an underground layer of shops. Deep below Seoul's main traffic vein is this hidden market packed full of indie skincare shops, designers, and flower markets. For off-the-beaten-path souvenirs or a taste of non-touristy, Korean fashion, this is the place to go. The next morning we woke up early, as it was our final few hours in this beautiful country. After breakfast at our hotel and nothing on our agenda, we simply started walking. Just around the corner from our hotel we stumbled upon this gorgeous, historic building marked as housing one of Seoul's very first print newspapers. Seeing as it was so early on a Sunday morning, Seoul was quiet. Shops were locked, workers were just beginning their preparations for the busy day ahead. It was calming and peaceful to witness Seoul before waking hours. It's a very complex city with deep alleys and small walkways. Our final stop before the airport was the Samziegil mall. An all outdoor, multilevel mall that is a hipster's dream. Indie stationary stores, craft leather and ceramic goods, can all be found sitting on top of a children-friendly, hands-on workshop underground. Authentic Korean tapestries, paintings and carvings can all be found here, draped under strings of paper flowers. I've never met a more hospitable, kind and inviting culture than that of South Korea. Everywhere we went, people greeted us and treated us as esteemed guests, accommodating and appreciative of our culture. This mentality help by the large population of American troops present in the country (there is a base smack in the middle of the Seoul). But to us, it was all the same. They didn't treat us like Americans, tourists or foreigners. For me, it was an apparent reminder that no matter who you encounter, the torment your country faces (espcially with neighbors like Kim Jong Un), we are all called to treat one another as humans. The contrast between the American and Korean attitudes toward those that don't look like them is evident, revealing and refreshing. 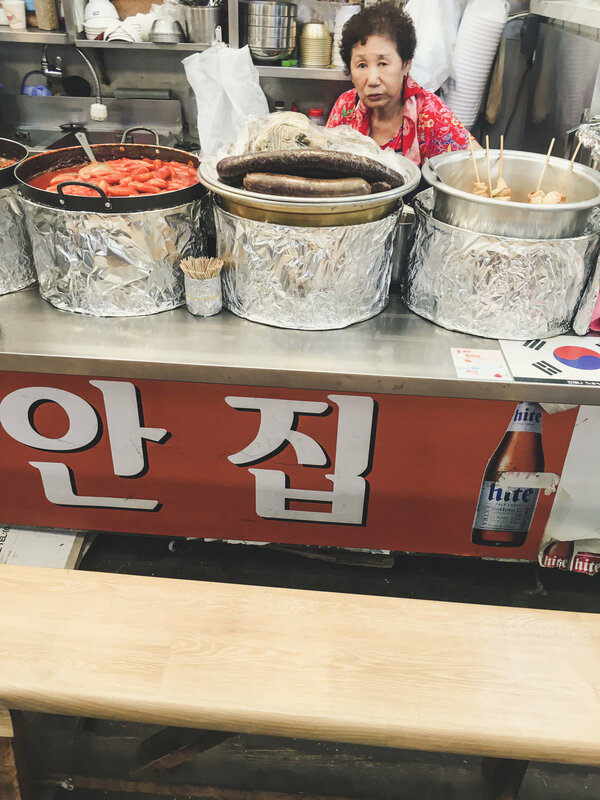 In just 6 days, the Korean culture taught me lessons in hospitality, kindness and generosity. Socially, Korea is one of the world's greatest superpowers, and I look forward to returning again someday soon. Explore Loudly. Love Loudly, Live Loudly.